The beautiful west coast of Florida is a glorious destination to visit. I am forever enchanted by the lush tropical foliage, scenic, award winning white talc-like beaches and stunning wildlife enjoyed during our vacations to the gulf coast. Recently, my husband and I spent the Thanksgiving holiday with family on Longboat Key, one of six islands along Sarasota's coastline. While visiting, I try to venture out every day, camera in hand, to areas that birds favor for feeding. Often I head out on foot, other times, we will drive to the bay side or travel to a beach or nature preserve. This year, I paid particular attention to the feeding habits of the many birds I observed while on my adventures. Some birds exhibit great precision and patience, others put on quite an interesting and entertaining display. 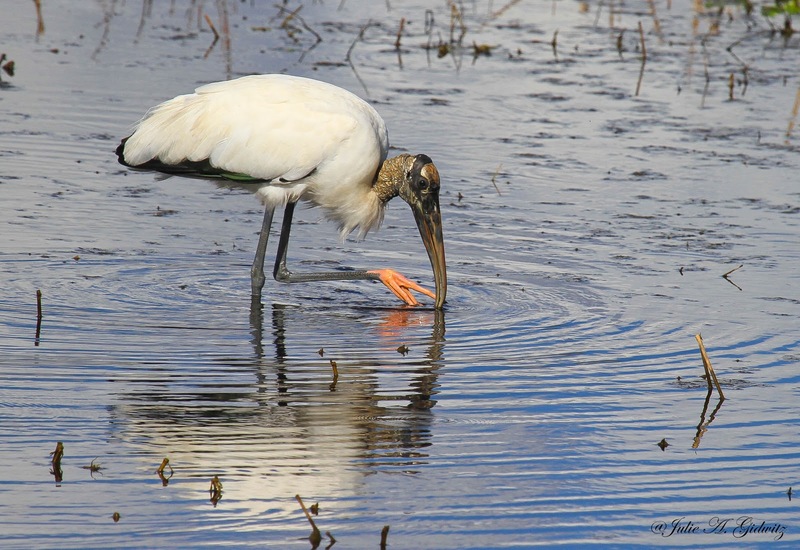 This post features photographs of several lovely birds and a few of their feeding techniques. Tricolored Herons are often seen foraging in shallow or belly-deep water. They stalk prey by walking, hopping or even running. The feeding behavior shown in the above and below photographs is called "canopy feeding". The heron extends both of its wings outward in order to create a large shaded area. 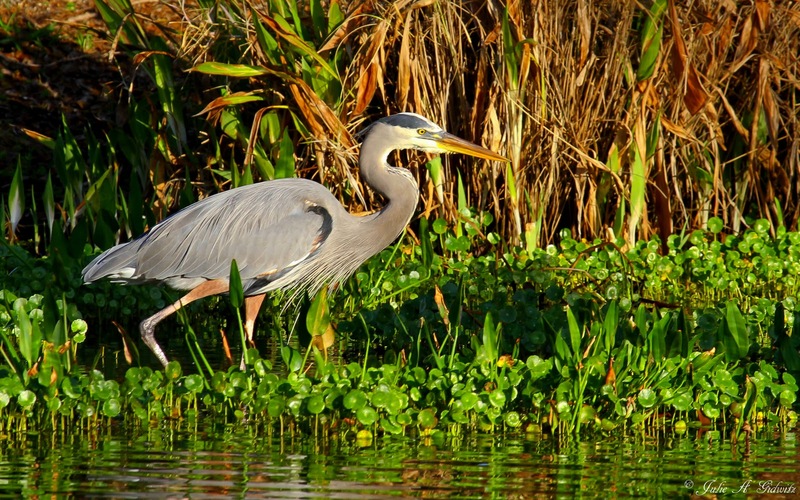 It is thought that the shadows created by the outstretched wings attract fish for the bird to feed on and/or reduces glare for keener hunting. These quiet birds are tactile feeders, meaning they hunt by touch. 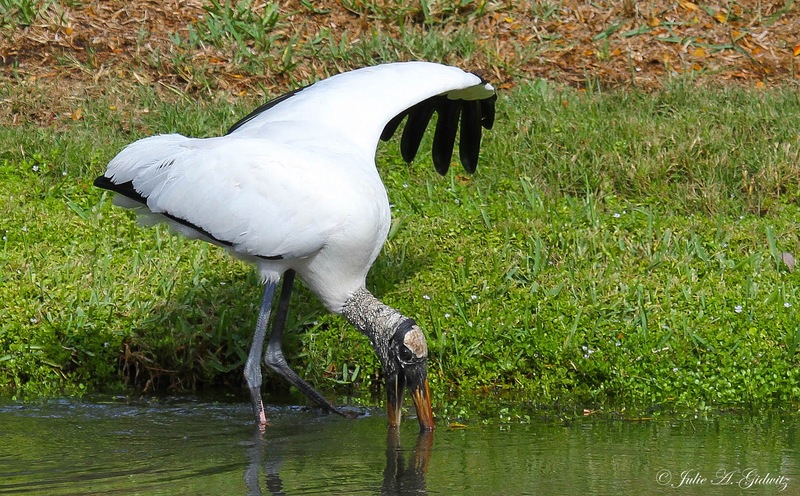 Wood Storks have a variety of foraging techniques. 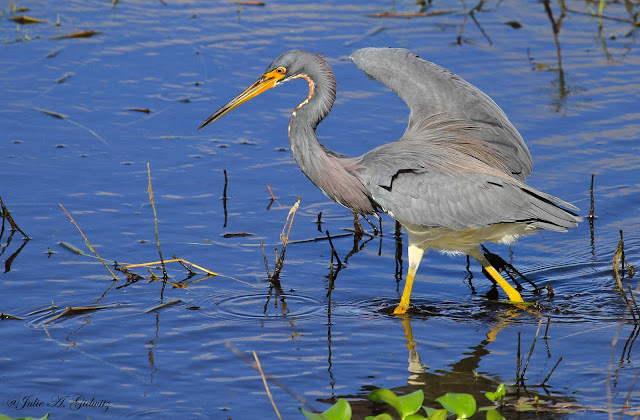 They will stir the water or grass with a foot to startle or flush out prey. These birds also locate food by sweeping their open bills back and forth though the water until it touches something desirable to eat. 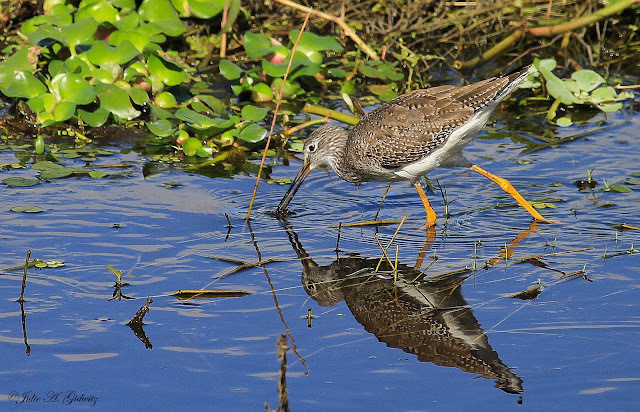 Greater Yellowlegs are enthusiastic feeders, sometimes running after rapidly moving aquatic prey. 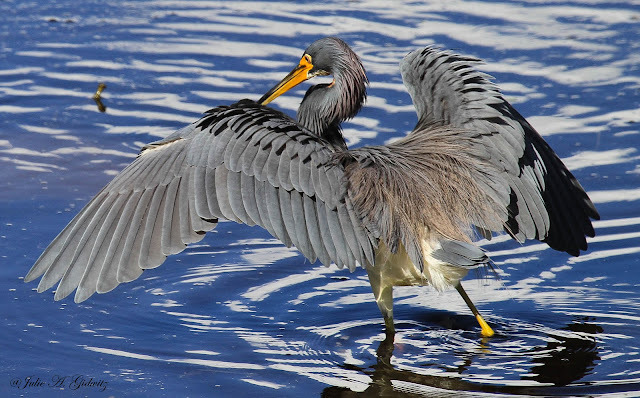 They will also stir up food by swinging their heads back and forth with just the tips of their bills in the water. This technique flushes up prey. 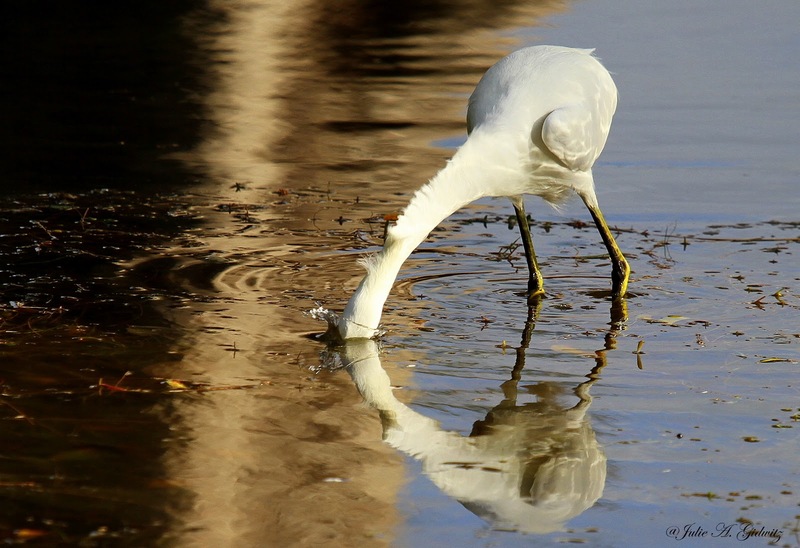 Great Egrets will often feed while standing motionless, eyes focused on the water, this allows prey to come within striking distance of their sharp, spear-like bills. With a quick thrust, they stab and then swallow their catch whole. Great Egrets will also stalk fish, amphibians, reptiles, small mammals and insects. 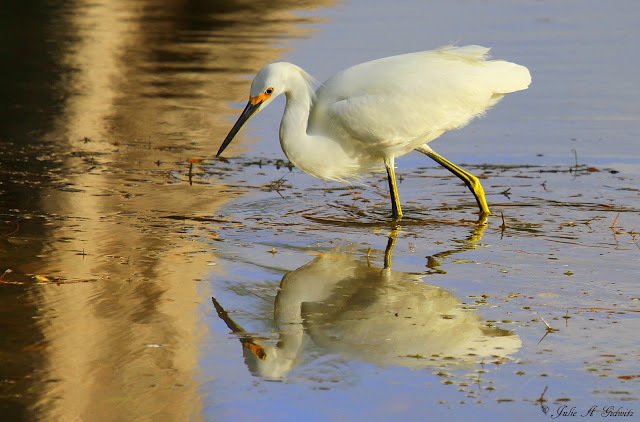 Snowy Egrets display a wide assortment of fishing methods. 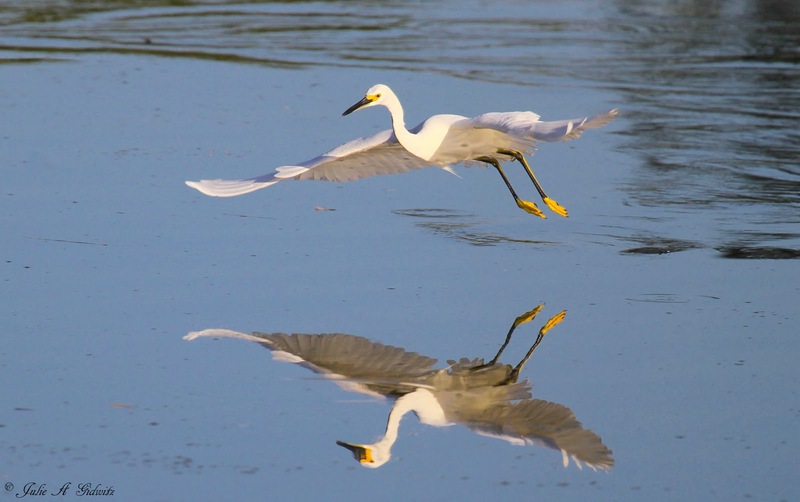 The above photo illustrates "dip-fishing", where they fly with their feet placed just over the water and continue in direct flight while catching prey at the waters surface. They will also use the technique of "foot-dragging". 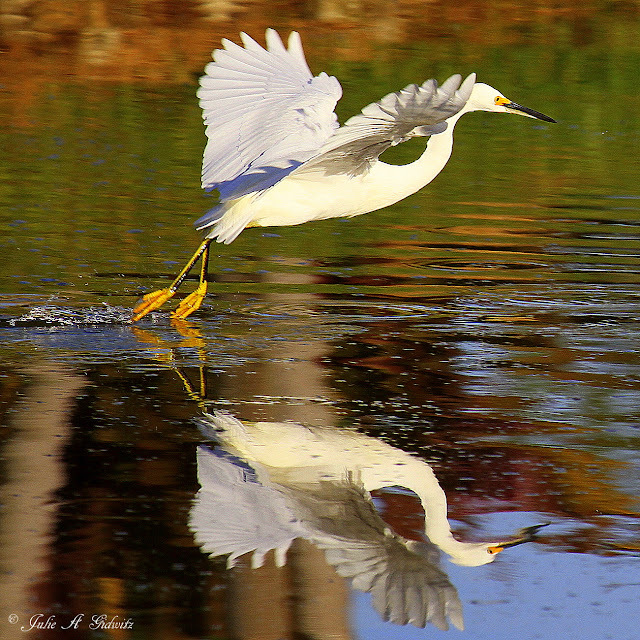 The egret will drag its toes or feet in the water. As it continues forward in flight, strikes are made. Great Blue Herons are visual hunters. They will stand erect or in a crouching position while wading through shallow waters. Once a fish is located, they will pierce it with their long, sharp bill. Some birds use the "opportunist" technique. A handout from a generous fisherman is always appreciated. A fun post and lovely photos Julie. There's no doubt about it, Julie, I thoroughly enjoyed your stunning photos. Great post, Julie! I especially love the lovely image of the egrets with the sunset as a backdrop! Julie, you photos are just fantastic. The reflections are amazing. I love the wood stork but all the birds are beautiful sightings. Great post, Happy New year! These are stunning and captivating! Your amazing photos are so rich in detail. Equally fabulous is the knowledge you shared about the feeding habits. I love them all--but especially like the view with the Egrets waiting or kindness from strangers, gorgeous! Beautiful photos Julie! 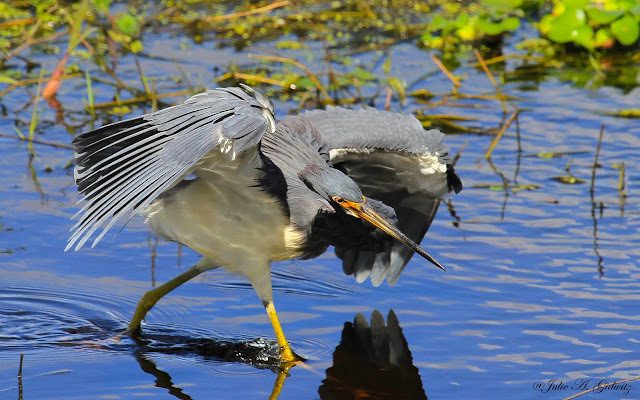 Cant wait to get to Florida in a few weeks to do some birding! Great captures. Can't wait to move to Florida....once I tell my wife that is! A great post! The photos are lovely. We have an opportunist Great Blue Heron that waits for us to turn off the fishing lights and leave the dock at night before he checks out the fish basket hanging beside the dock. One time our grandson had left some trout there to clean in the morning but by morning there were none left! Wowza! Absolutely stunning photos Julie. Really makes me want to go back to Florida, as I absolutely love the Gulf Coast area. Birding nirvana! Thank you for the fantastic photos. Love them all!